After completing a MA in Physics at Oxford University, Mark spent a short time working on an oil rig off Aberdeen, before joining the Royal Shakespeare Company. He became Systems Engineering Manager at the Barbican, primarily responsible for the maintenance of one of the first power flying systems installed in the UK. Whilst at the Barbican, he studied for a management diploma and a MAc in robotics and automation. He subsequently joined a stage engineering company and was responsible for the design of various automation and power flying systems. 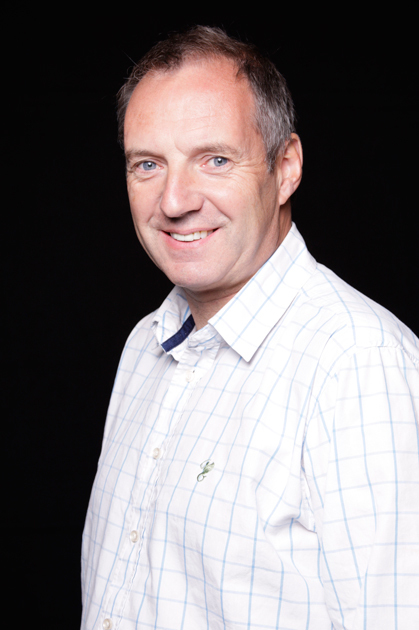 After three years working for an industrial automation company providing motion control systems, Mark set up Stage Technologies with John Hastie in 1994, combining their knowledge of the industry and new technologies to produce specialist theatre automation systems. During the early years of Stage Technologies, Mark was directly involved with the development of the Acrobat control system, a computerized control system allowing multiple groups of axes to be controlled from a single console. He also worked on the development of a system to allow free ranging computer-controlled trucks to move to pre-plotted positions on the stage, now in its second generation of production for Las Vegas shows. The development of Pathway software was a significant milestone in automation technology, allowing an operator to plot 3-dimensional paths in space. This later evolved into Stage Technologies' Visual Creator software, which allows the operator to plot a 6-degree of freedom path and complex 3-dimensional automated moves. Mark has designed radio control systems of remote systems (primarily for stage trucks) and PLC software and hardware systems and has worked on Unix-based programming in C, Windows based programming in C, C++, Visual Basic and writing drivers for remote I/O systems. In addition to Mark's many areas of expertise, he has also lectured at various theatre colleges and been invited to speak at numerous industry conferences on the topic of theatre automation and stage engineering. He is also written a book on automation for professionals and students, first published in 2009. Mark devotes considerable time to promoting the awareness of engineering as a career, and is involved in the 'Make your mark' campaign that actively promotes engineering in schools and colleges around the UK.